The 'E-volved' table is designed for use indoors and outdoors. The glass top puts the organically knotted stainless-steel frame into the limelight from all sides such as it was made of a single piece. 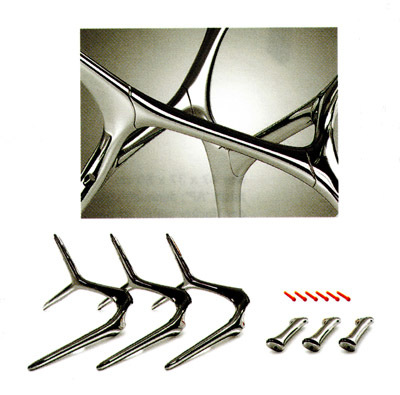 But the three-legged frame is a combination of three times two identical cast parts which, after assembly, are welded together invisibly at the seams and then polished by hand to a high gloss. Although the design was awarded a Red Dot back in 2007, it was only now that a manufacturer was ready to transform the sophisticated structure into a product applying the great degree of perfection needed here. The sturdy frame is offered both separately and with glass tops of 140 or 150 cm dia. and an overall height of 74 cm. - A homage to Diego Giacometti. The basis of the complex frame knot consists of two cast parts. After assembly, all seams are perfectly welded, and the stainless-steel surface is polished by hand.